The project to replace and expand the I-5 bridge between Oregon and Washington, a.k.a. the “Columbia River Crossing,” has been watched by transportation experts around the country as a case study in the dynamics of a highway boondoggle. Earlier this year, when state lawmakers in Washington State refused to fund their portion of the project, observers proclaimed the project dead. But big highway proposals die hard. Groups invested in the concept recently revived the plans and are pressing again to build it, with some revisions. Despite the recent setback, the new version has many of the same flaws that made the previous proposal so unpopular. Basically, the expense can’t be justified. Aaron Renn at the Urbanophile points to a recent report by economist Joe Cortright, who flagged an analysis of the CRC for investors by project consultant CDM Smith. 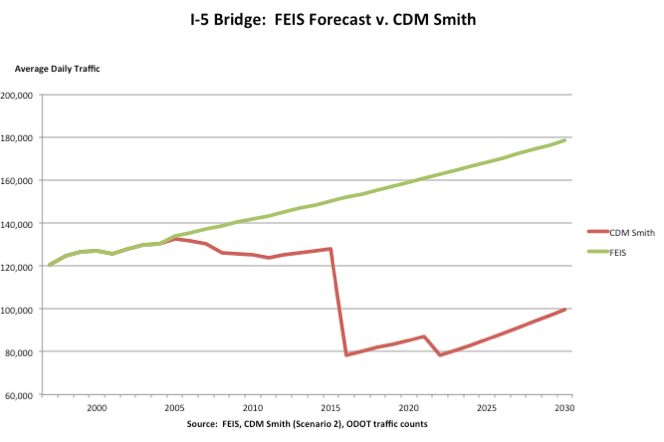 Those forecasts, obtained by Cortright through a public records request, predict that traffic on the bridge will actually decline after it is built and tolled — an outcome that is completely at odds with what Oregon DOT claimed in its environmental impact statement. Oregon DOT director Matt Garrett released a letter in response in which he says, “This work is fundamentally different than the traffic analysis completed for the Final Environmental Impact Statement, and with very different goals in mind.” I agree. The FEIS was performed with the goal of getting this bridge the DOT wanted built approved. The toll study was designed to withstand financial scrutiny on Wall Street and be relied on in selling securities. I’ll let you be the judge of which is more likely to be closer to the truth. Want to know how it is that we spend so much money on transport infrastructure and get so little value? It’s because far too many of our highway dollars go into boondoggle mega-projects ginned up through political pressure … instead of into projects that make transportation sense. Elsewhere on the Network today: World Streets outlines some of the trends emerging in the North American car-sharing industry. Systemic Failure explains one of the chief drawbacks of sharrows. And Urban Review STL ponders how to reduce conflicts between bus routes and major civic events on downtown streets. PS… the LRT piece doesn’t make any sense either. The saddest part of the CRC mess is that a high-yield, moderate cost (~ $100M / $10**8, 1990’s est.) rail bridge upgrade just downstream isn’t being pursued. Fix that problem and the design of the CRC simplifies and comes down in cost. Also, if ODOT wants a bridge so much how about a bridge to Hayden Island only ? Isn’t one of the design principles of the interstate highway system is that it bypasses minor destinations and leaves those to local roads ? I took a look at the area on Google Maps and noted an obvious road bridge site next to the rail bridge. It could tie into OR120 (N. Portland Rd. / N. Marine Dr.) in the midst of an industrial area. The probable touchdown point on the island is currently a huge parking lot. So, ODOT, what will it be ? A giga-project to gag on or several kilo+ projects that the system can swallow ? P.S. The local opposition to the CRC came up with the Common Sense Alternative (aka CSA, Vimeo video). CRC supporters are suffering from cognitive dissonance if they think a cringe-worthy rebranding attempt will make the public forget the facts. Temporary short-term job gains will be nullified by the demolishing of some 70 businesses on Hayden Island to make room for the 600 foot wide, 22 lane interchange. Adding more lanes will not relieve traffic, it will incentivize more congestion, more pollution, and more carbon emissions that will worsen our climate crisis. Tolling will fall far short of providing the cash needed to pay off the project, leaving taxpayers to pick up the tab while the rest of our state’s roads continue to deteriorate. The price tag of $4.2 billion has been projected to balloon to as much as $10 billion dollars by the end of construction. The number of falsehoods and outright lies being sold to the public could fill a phone book. Why would a physician governor, who took a trip to Bhutan to study happiness, try to hog-tie Oregonians with debt for something that is carbon-irresponsible and would not work? What sort of organism has disabled his frontal lobe? The owner of that downstream rail bridge, BNSF Railway, doesn’t want to play that sort of ball. 520 Floating Bridge here in Seattle showed this phenomenon. Started tolling the existing structure to help pay for the new one being built right now and the usage dropped way off. WSDOT had to recalculate the toll revenue and now the project is even more in the hole. Seems like it shouldn’t be a shock to anyone. BNSF would be perfectly happy to relocate the swing span on the bridge if someone else (state government) paid for it. The location of the swing span is the only problem with the bridge; it causes trouble for shipping. Half of the very expensive design of the CRC is supposedly designed to “alleviate” this problem with shipping, but relocating the swing span on the BNSF bridge would FIX the problem. The Final Act for Portland’s $3 Billion CRC Highway Boondoggle? Ding Dong, Portland’s CRC Mega-Highway Is Dead!